This isn't exactly old news, been a bit swamped with crazy anime figure orders but I'm breaking from the endless boxing to let you all know of what I will be doing in regards to this issue. Provide a small white star sticker for you to place on her. They would take the figure back to be painted. Well, the bad news for us anime fans overseas (and anime stores too -_-) Good Smile has refused to do option 2 for overseas buyers. So all of the BRS figures I'm getting will come with the sticker. As a collector myself, I don't really find a big deal about adding the sticker on mine..but understandably..it could be a big deal for some people. I'd wish GSC would have just done what they tend to do with their figures... delay them for another month or so. 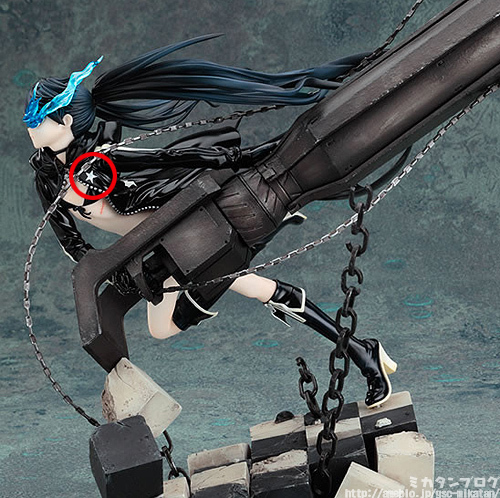 The figure has already been released in Japan, but it looks to be about another couple of weeks before I get them. I'll make sure to keep anyone who pre-ordered her in touch with the details.